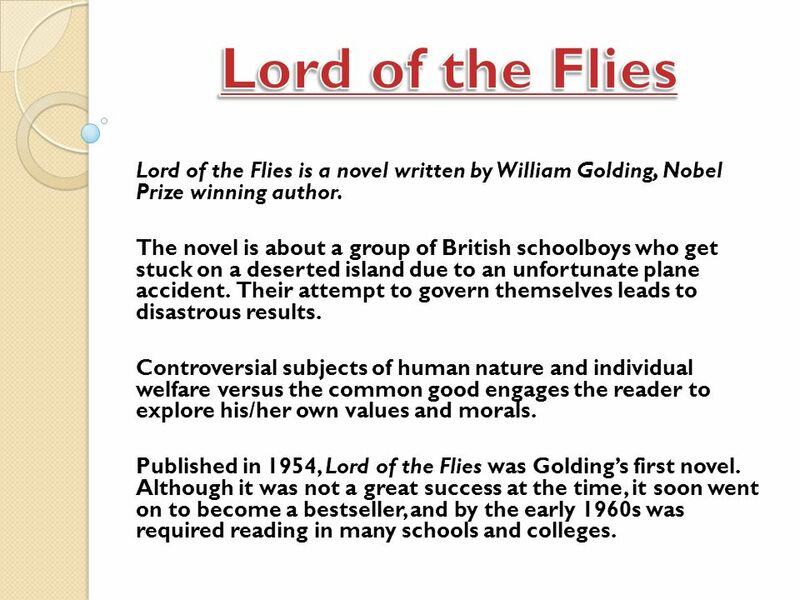 2 Lord of the Flies Lord of the Flies is a novel written by William Golding, Nobel Prize winning author. The novel is about a group of British schoolboys who get stuck on a deserted island due to an unfortunate plane accident. Their attempt to govern themselves leads to disastrous results. Controversial subjects of human nature and individual welfare versus the common good engages the reader to explore his/her own values and morals. Published in 1954, Lord of the Flies was Golding’s first novel. Although it was not a great success at the time, it soon went on to become a bestseller, and by the early 1960s was required reading in many schools and colleges. 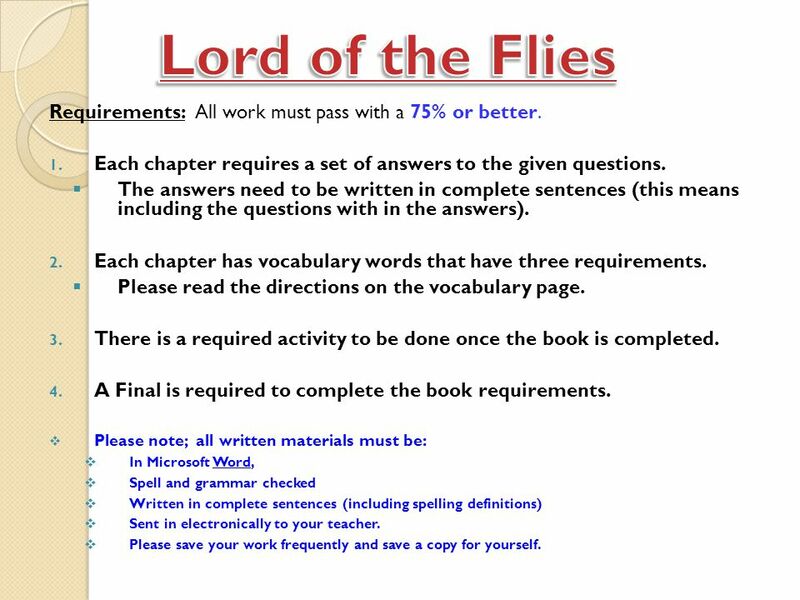 3 Lord of the Flies Requirements: All work must pass with a 75% or better. 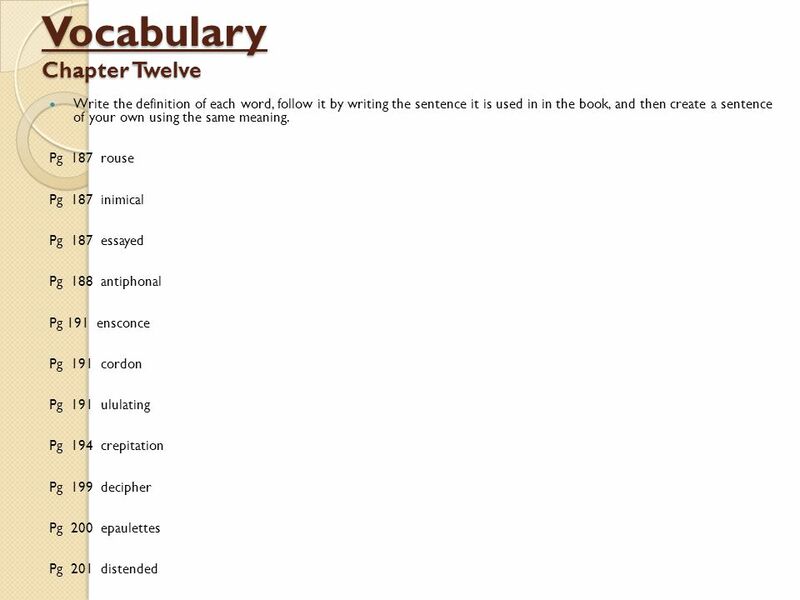 Each chapter requires a set of answers to the given questions. 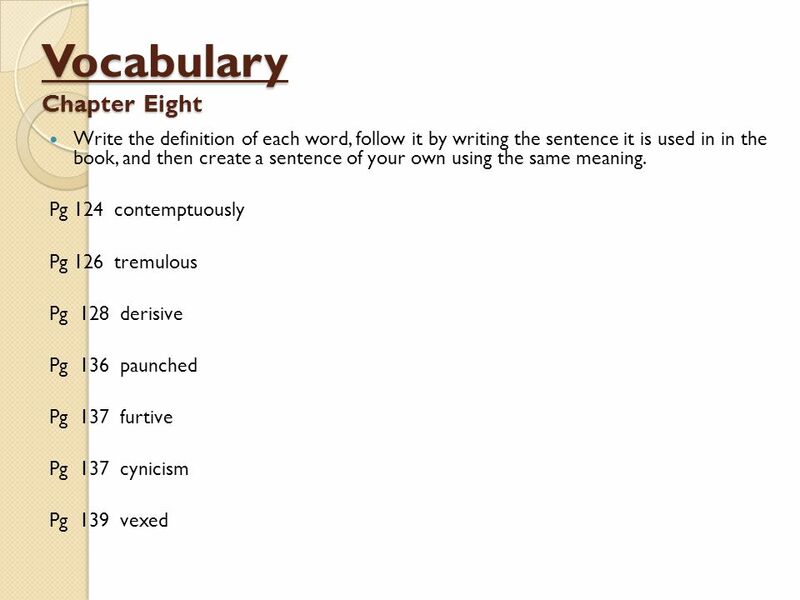 The answers need to be written in complete sentences (this means including the questions with in the answers). 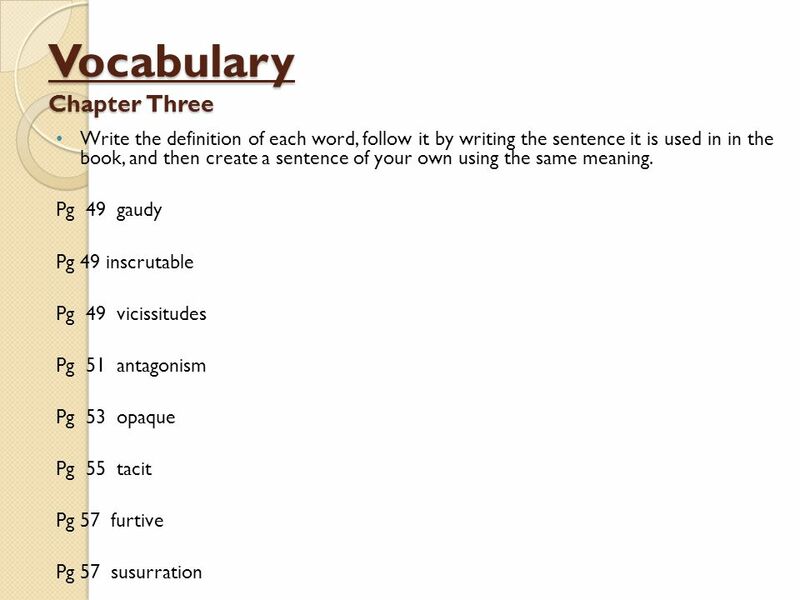 Each chapter has vocabulary words that have three requirements. 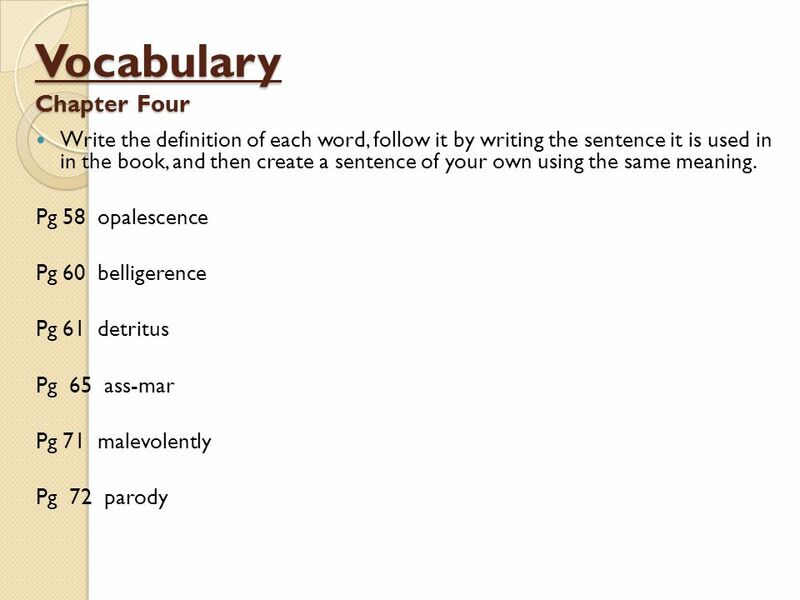 Please read the directions on the vocabulary page. There is a required activity to be done once the book is completed. A Final is required to complete the book requirements. 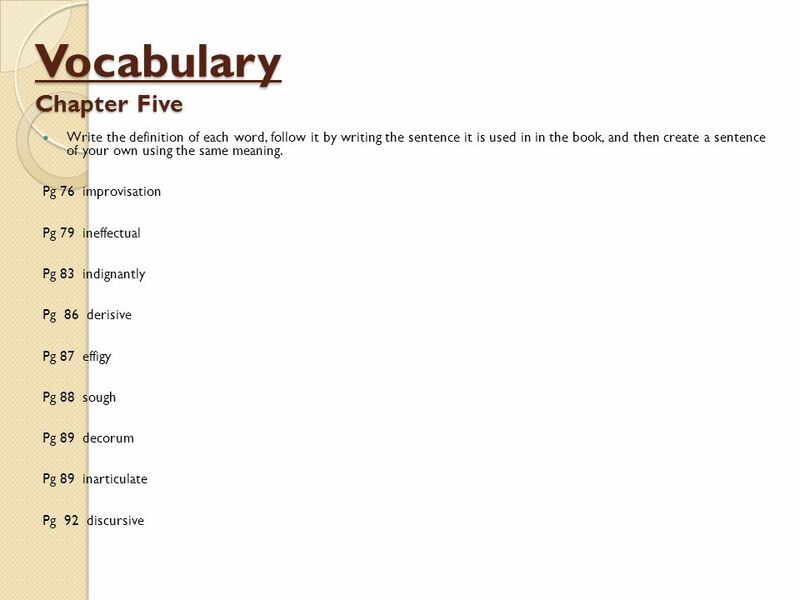 Please note; all written materials must be done in Word, spell and grammar checked , written in complete sentences (including spelling definitions) and sent in electronically to your teacher. Please save your work frequently and save a copy for yourself. 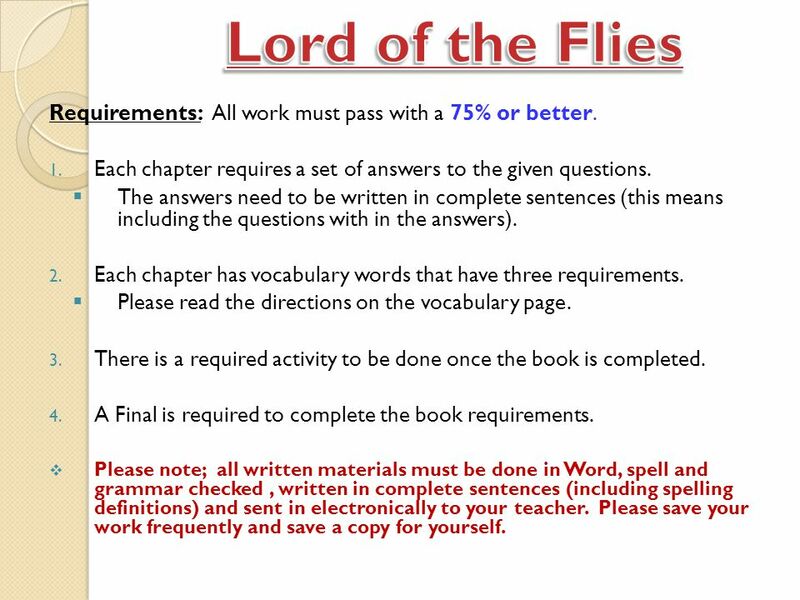 4 Lord of the Flies Requirements: All work must pass with a 75% or better. 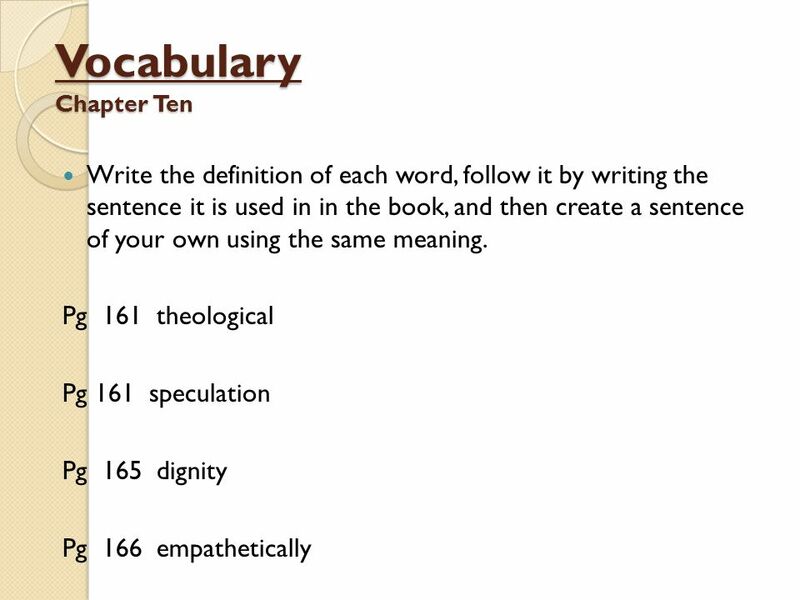 Each chapter requires a set of answers to the given questions. 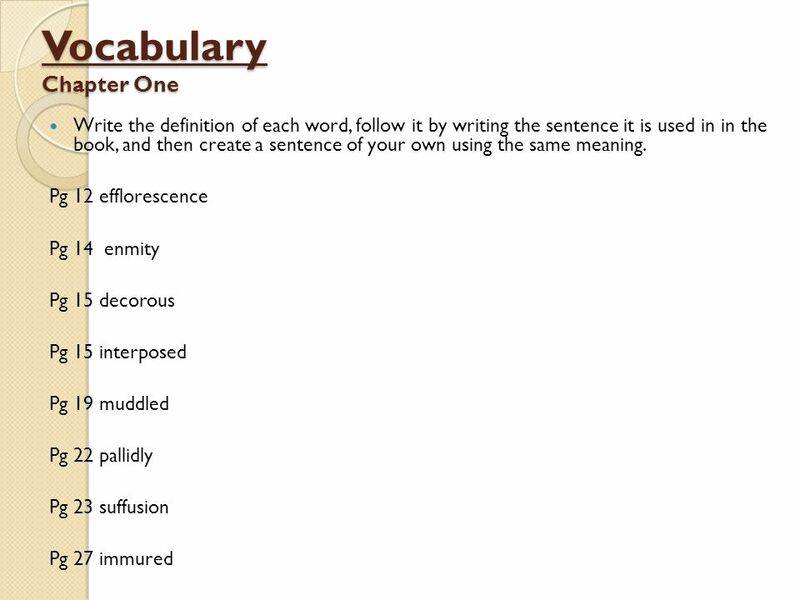 The answers need to be written in complete sentences (this means including the questions with in the answers). 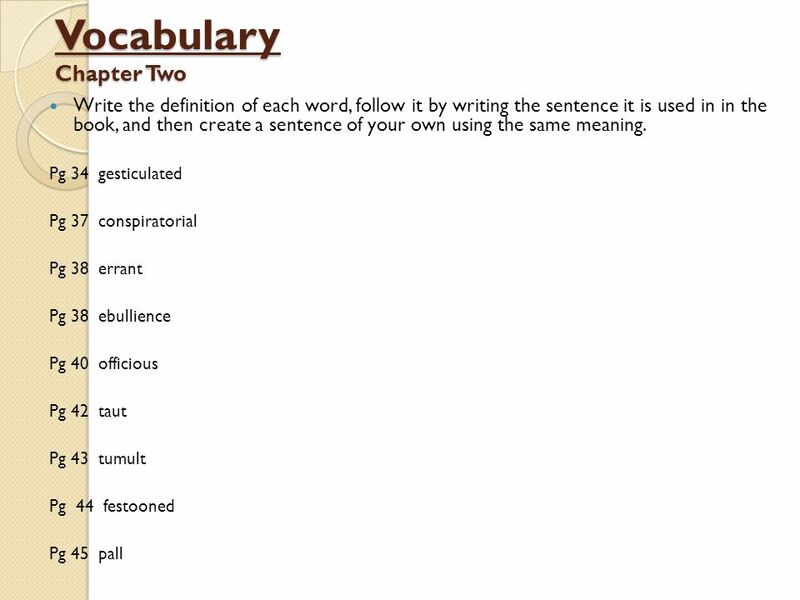 Each chapter has vocabulary words that have three requirements. 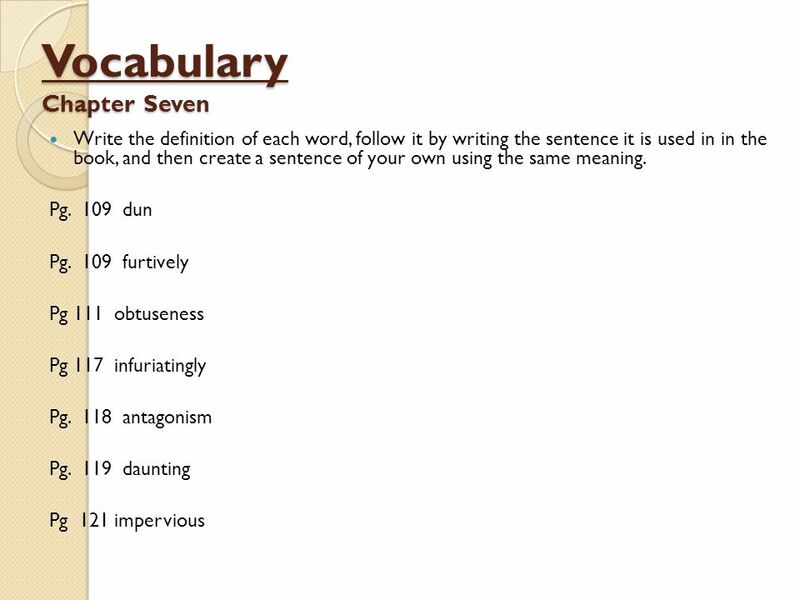 Please read the directions on the vocabulary page. There is a required activity to be done once the book is completed. A Final is required to complete the book requirements. 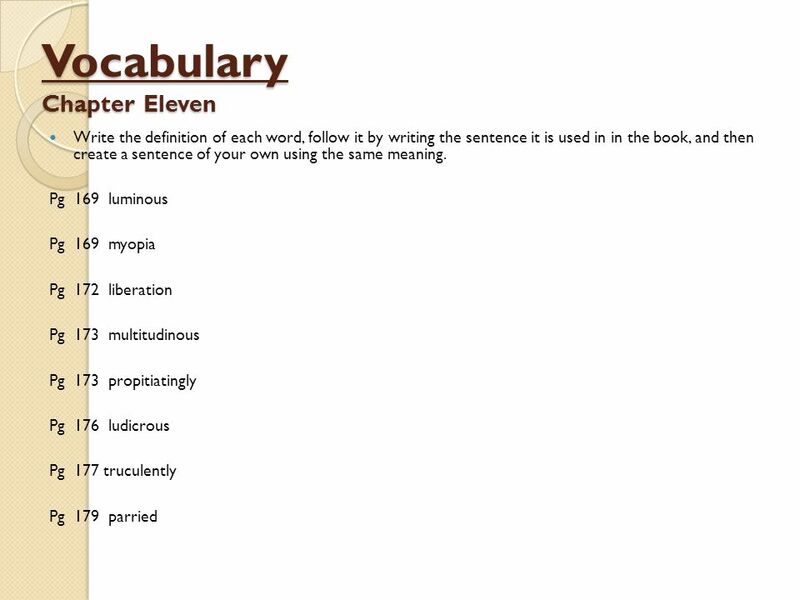 Please note; all written materials must be: In Microsoft Word, Spell and grammar checked Written in complete sentences (including spelling definitions) Sent in electronically to your teacher. Please save your work frequently and save a copy for yourself. 1. Why couldn’t the boys rely on a rescue party to be searching for them? 2. What happened to all the boys’ relatives? 3. How did the boys end up on the island? 4. What valuable item did Ralph and Piggy get from the fern weeds by the lagoon? 5. What kind of group was Merridew in charge of? 6. 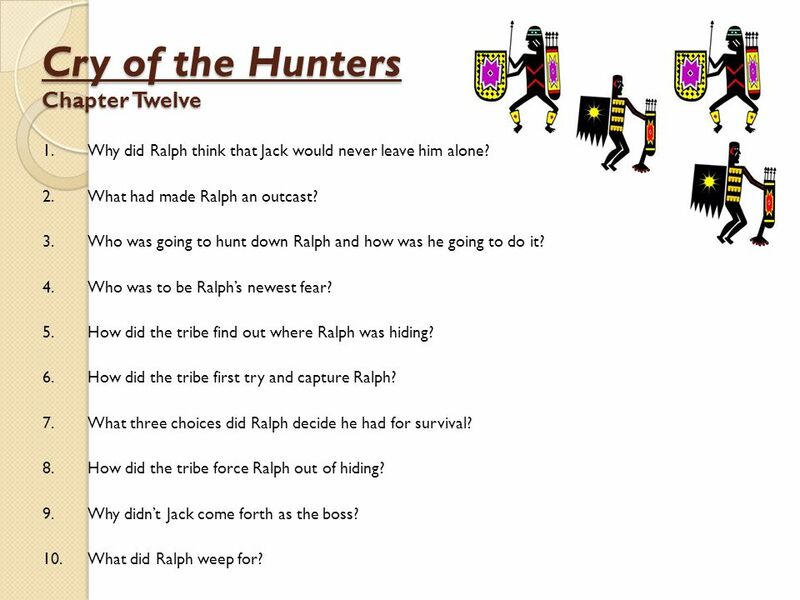 Why did Ralph offer Jack charge of the hunters? 7. 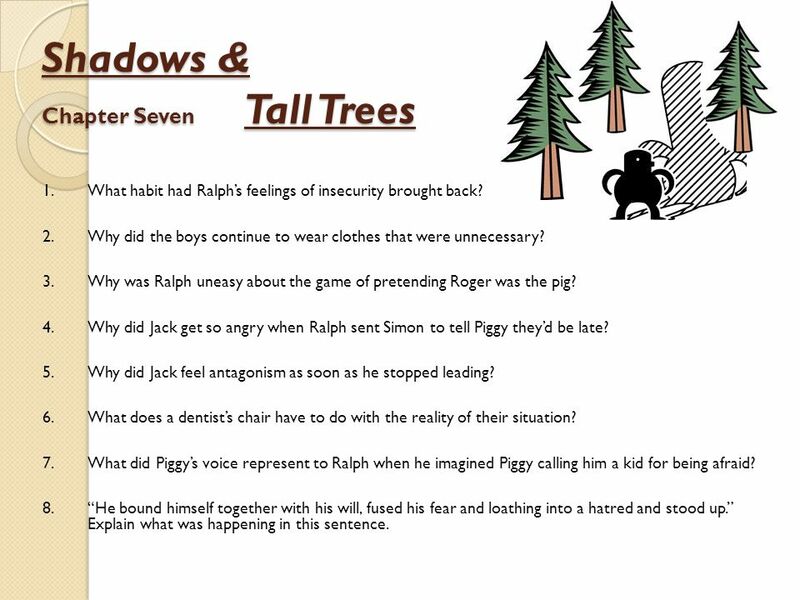 How did Ralph pacify Piggy’s feelings about having told everyone what his nickname was and not allowing him to go on the expedition? 8. Describe the island and the surrounding waters. 9. Why wasn’t Jack able to stab the trapped pig? 1. 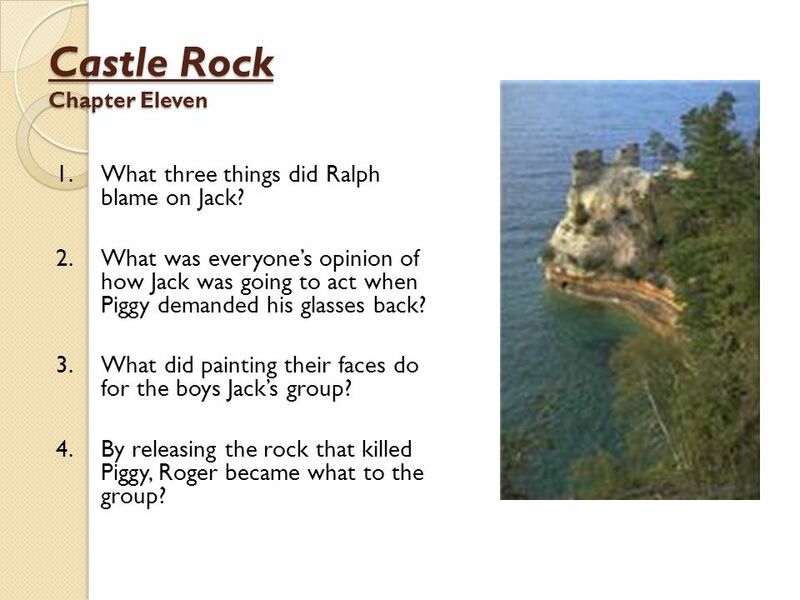 How would you describe the personalities of Ralph, Piggy, and Jack? 2. How can their personalities benefit their situation? 3. How can their personalities cause problems given their situation? 4. Why was Ralph so interested in making sure that everyone believed there was no such thing as a beast on the island? 5. What foolish realization came as all the boys finished gathering up the wood for the fire? 6. What was happening between Jack and Piggy? 7. Why couldn’t Piggy get the other boys to respect him when it was obvious that he had intelligence and common sense? 8. Once Piggy got a chance to speak, Ralph ended up throwing blame towards him for not knowing how many boys there were and what everyone’s name was, why? 9. What was causing Piggy to grasp for breath? 10. Why did Ralph feel ashamed when everyone realized that the little boy with the mark on his face was missing? What are the “creepers” that the author keeps bringing up? Why were Jack and Ralph so frustrated? What was the emotional benefit of having shelters built? How could Jack and Ralph love and hate each other at the same time? Why did Simon go into the forest and hide? How was the old life and conditionings still impacting the boys on the island? Why was Jack “painting” his face? Draw a picture of how Jack’s face looked painted. 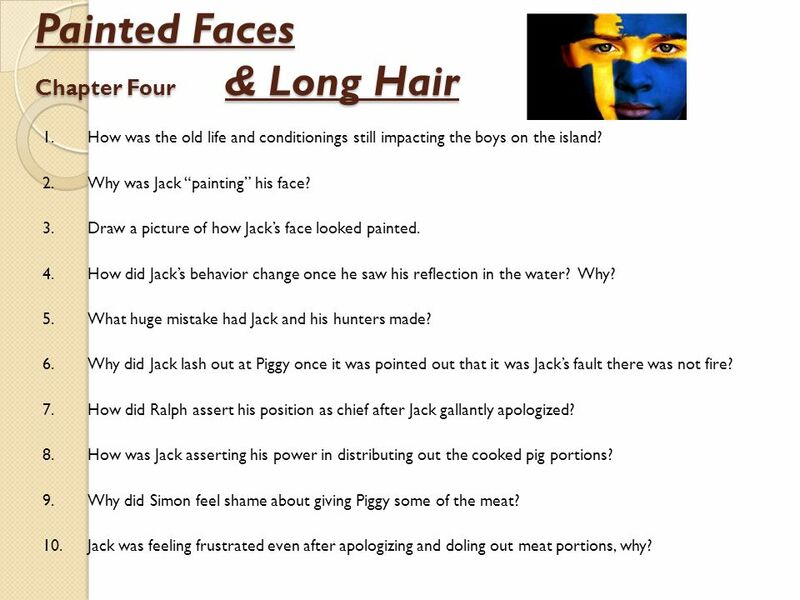 How did Jack’s behavior change once he saw his reflection in the water? Why? What huge mistake had Jack and his hunters made? 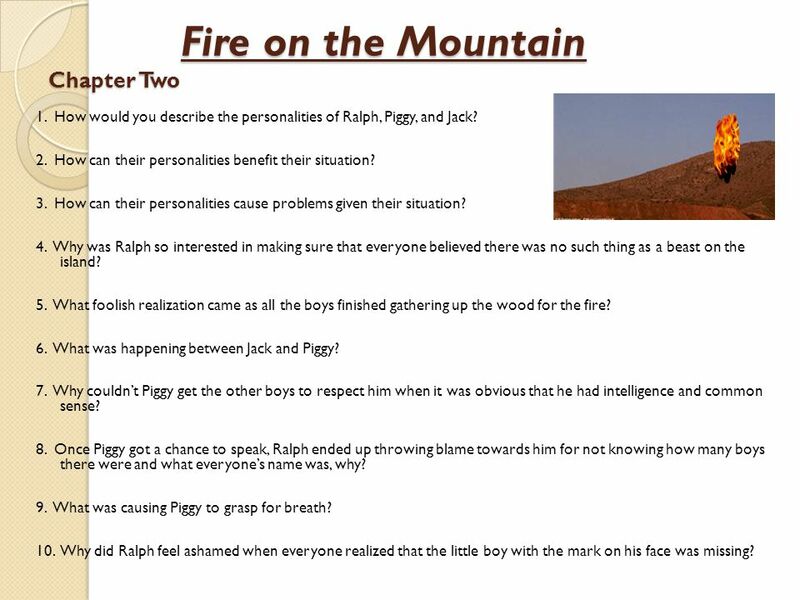 Why did Jack lash out at Piggy once it was pointed out that it was Jack’s fault there was not fire? How did Ralph assert his position as chief after Jack gallantly apologized? How was Jack asserting his power in distributing out the cooked pig portions? Why did Simon feel shame about giving Piggy some of the meat? Jack was feeling frustrated even after apologizing and doling out meat portions, why? 1. What was the weariness Ralph was beginning to feel? 2. Ralph began to appreciate certain qualities in Piggy, what were they? 3. 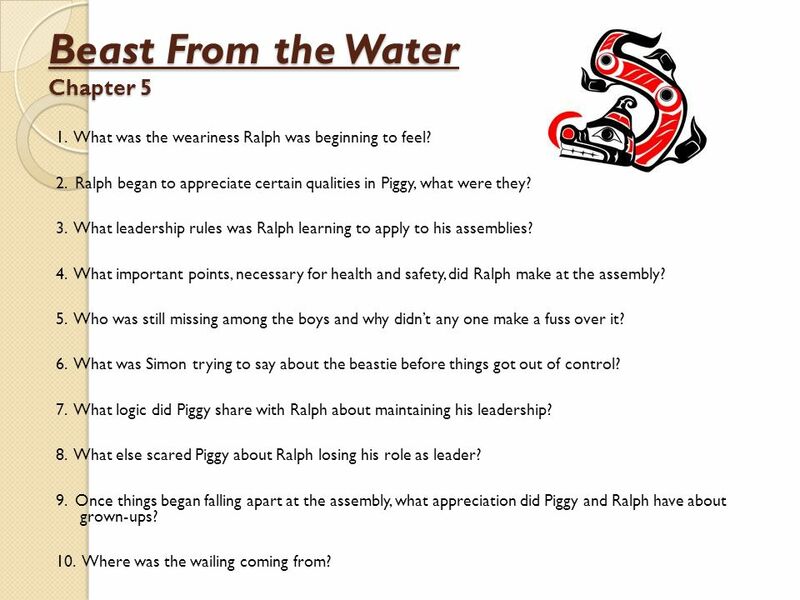 What leadership rules was Ralph learning to apply to his assemblies? 4. What important points, necessary for health and safety, did Ralph make at the assembly? 5. Who was still missing among the boys and why didn’t any one make a fuss over it? 6. What was Simon trying to say about the beastie before things got out of control? 7. What logic did Piggy share with Ralph about maintaining his leadership? 8. What else scared Piggy about Ralph losing his role as leader? 9. Once things began falling apart at the assembly, what appreciation did Piggy and Ralph have about grown-ups? 10. Where was the wailing coming from? Who were the twins talking about when they said, “He was waxy?” What do you think the term waxy means? 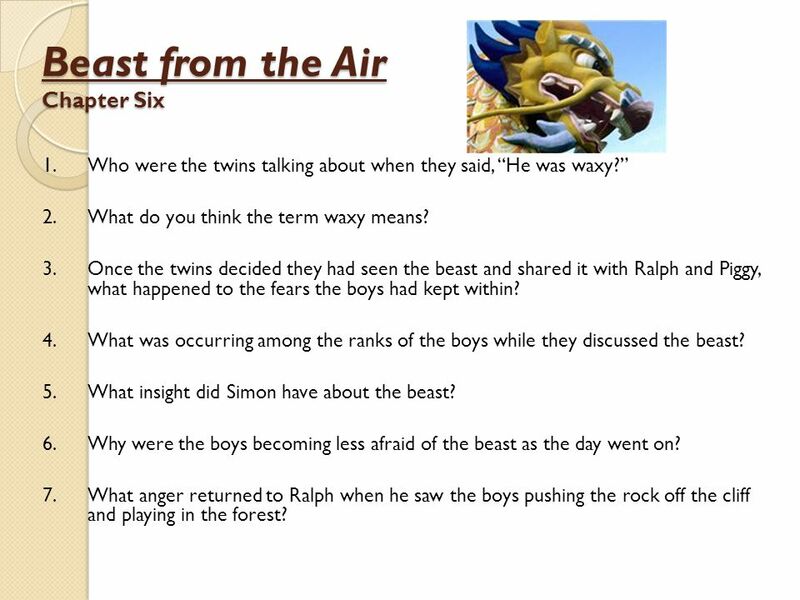 Once the twins decided they had seen the beast and shared it with Ralph and Piggy, what happened to the fears the boys had kept within? What was occurring among the ranks of the boys while they discussed the beast? 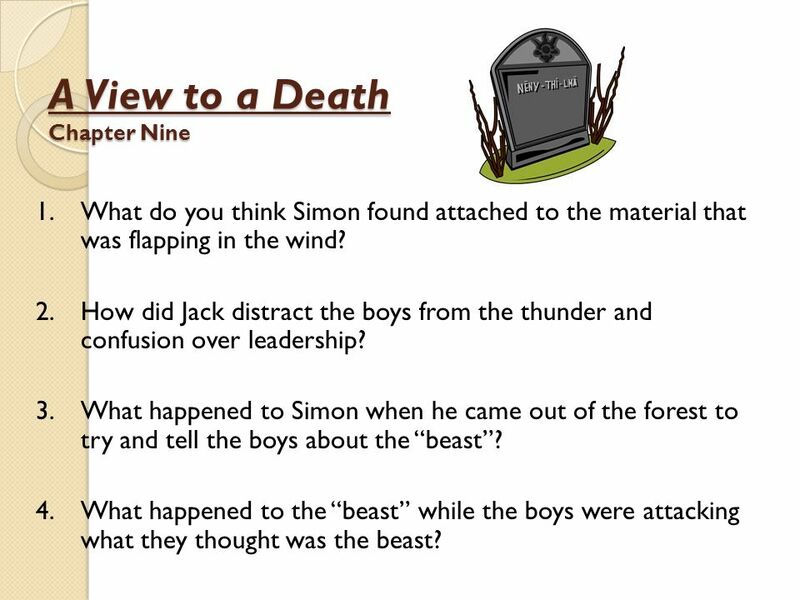 What insight did Simon have about the beast? Why were the boys becoming less afraid of the beast as the day went on? What anger returned to Ralph when he saw the boys pushing the rock off the cliff and playing in the forest? What habit had Ralph’s feelings of insecurity brought back? Why did the boys continue to wear clothes that were unnecessary? Why was Ralph uneasy about the game of pretending Roger was the pig? Why did Jack get so angry when Ralph sent Simon to tell Piggy they’d be late? Why did Jack feel antagonism as soon as he stopped leading? What does a dentist’s chair have to do with the reality of their situation? What did Piggy’s voice represent to Ralph when he imagined Piggy calling him a kid for being afraid? “He bound himself together with his will, fused his fear and loathing into a hatred and stood up.” Explain what was happening in this sentence. Jack was changing his status among the boys through what action? In what ways was Jack trying to convince the other boys that Ralph shouldn’t be the chief any longer? What help was Piggy once Jack had withdrawn from the group? What was happening among the older boys while the fire was being made? Why was Piggy so pleased about the split among the boys? Jack was beginning to form his own civilization. How did he purpose to encourage the beast to leave them alone? How did the book come to be named “Lord of the Flies”? What did still having the conch shell represent? How did Ralph make the others not take Jack seriously? What do you think happened to Simon at the end of the chapter? What do you think Simon found attached to the material that was flapping in the wind? How did Jack distract the boys from the thunder and confusion over leadership? What happened to Simon when he came out of the forest to try and tell the boys about the “beast”? What happened to the “beast” while the boys were attacking what they thought was the beast? Why wouldn’t Piggy admit that the boys had murdered Simon? How did Jack use the beast to empower his control over the boys? How did Jack distort the fact that they had killed Simon instead of the beast? Explain the double function of the fire? Why was Ralph forgetting the importance of keeping a fire going? “If we don’t get home soon we’ll be barmy.” What did Piggy mean by this? 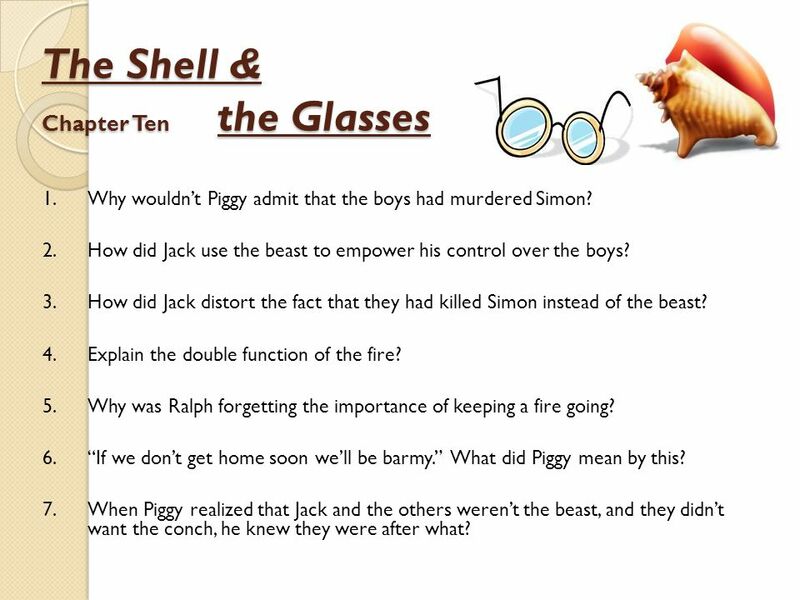 When Piggy realized that Jack and the others weren’t the beast, and they didn’t want the conch, he knew they were after what? What three things did Ralph blame on Jack? What was everyone’s opinion of how Jack was going to act when Piggy demanded his glasses back? What did painting their faces do for the boys Jack’s group? By releasing the rock that killed Piggy, Roger became what to the group? Why did Ralph think that Jack would never leave him alone? What had made Ralph an outcast? Who was going to hunt down Ralph and how was he going to do it? Who was to be Ralph’s newest fear? How did the tribe find out where Ralph was hiding? How did the tribe first try and capture Ralph? What three choices did Ralph decide he had for survival? How did the tribe force Ralph out of hiding? Why didn’t Jack come forth as the boss? What did Ralph weep for? Choose a project from the Project Table and turn in into your teacher. 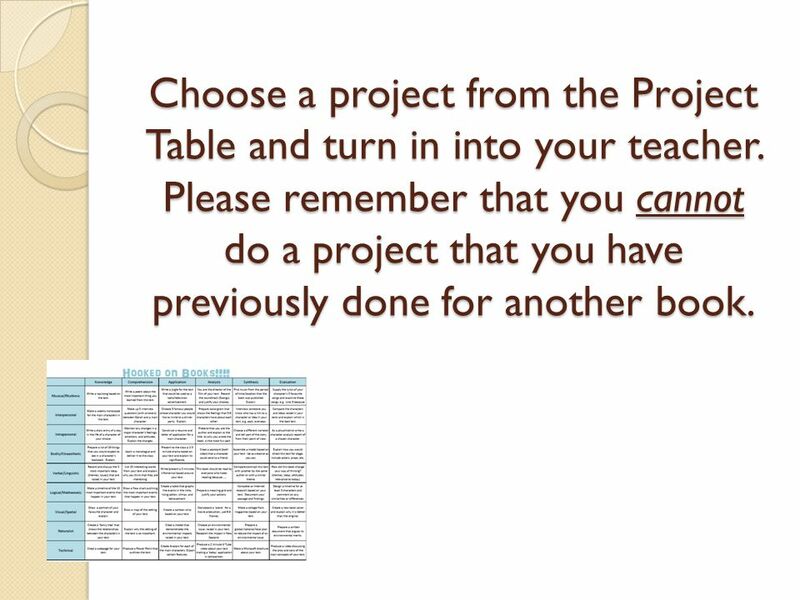 Please remember that you cannot do a project that you have previously done for another book. 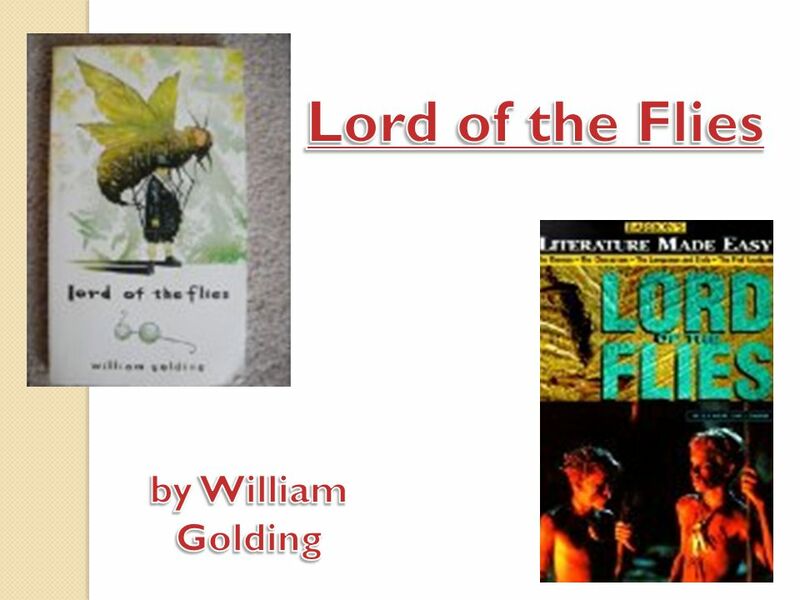 Download ppt "Lord of the Flies by William Golding." THE BARRETT BOWL Lord of the Flies Edition. Rules No name calling No whining  No use of any notes Remember to keep your voices low when discussing answers. Lord Of The Flies HOPE By: Jacki, Darcie, and Kyle. 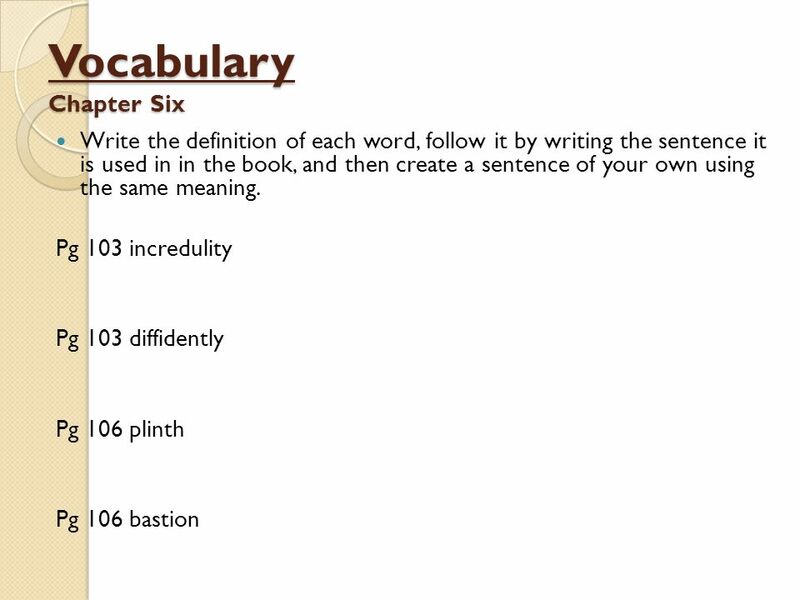 English 10 Ms. Bugasch November 6, 2013 “F” Day Goals 1.Hand in IRAs 2.Review and discuss Chapter 7 in LOF. 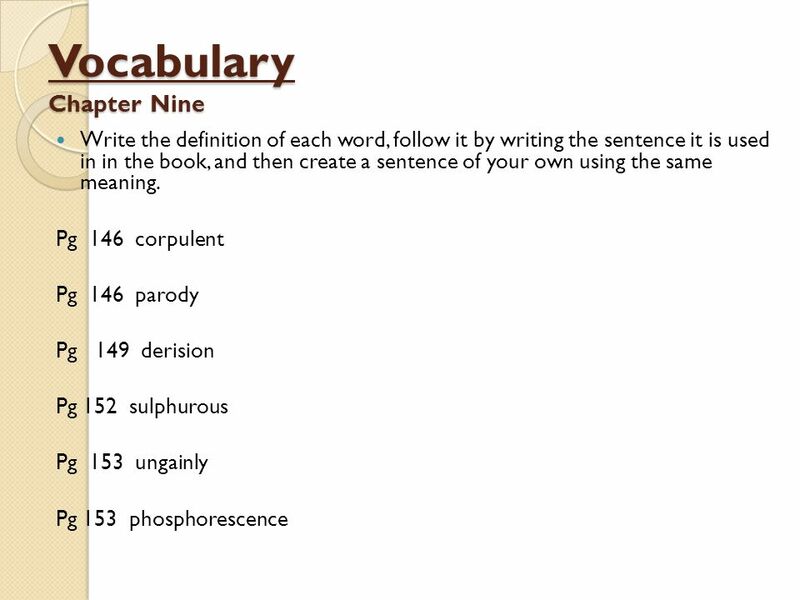 P p Quiz Chapter 1. P p Quiz Chapter 1 POP QUIZ CH 1 Where does the boys’ plane land? How do they announce they're having a meeting? Which boy. Lord of the Flies Chapters 7-9. 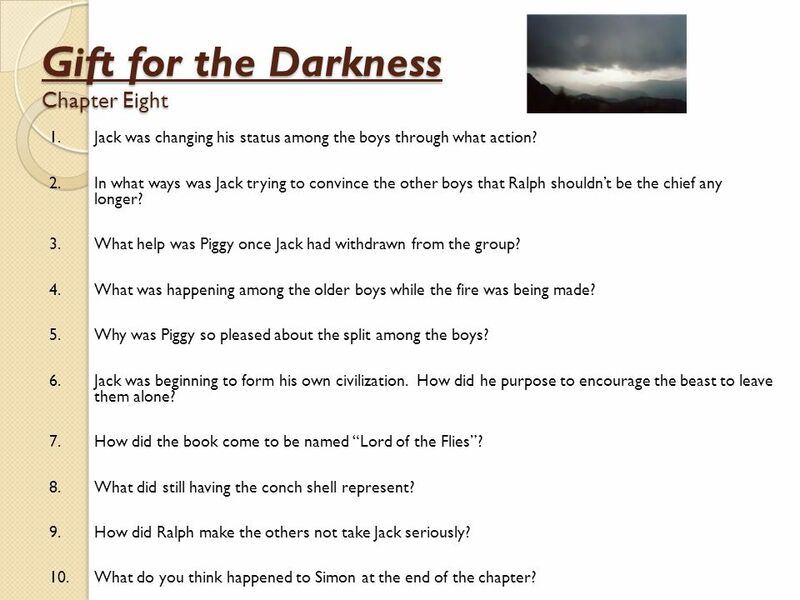 Literature in the Classroom: Lord of the Flies Preliminary points Frequency: one session per week (double lesson if possible) in order to give enough time. 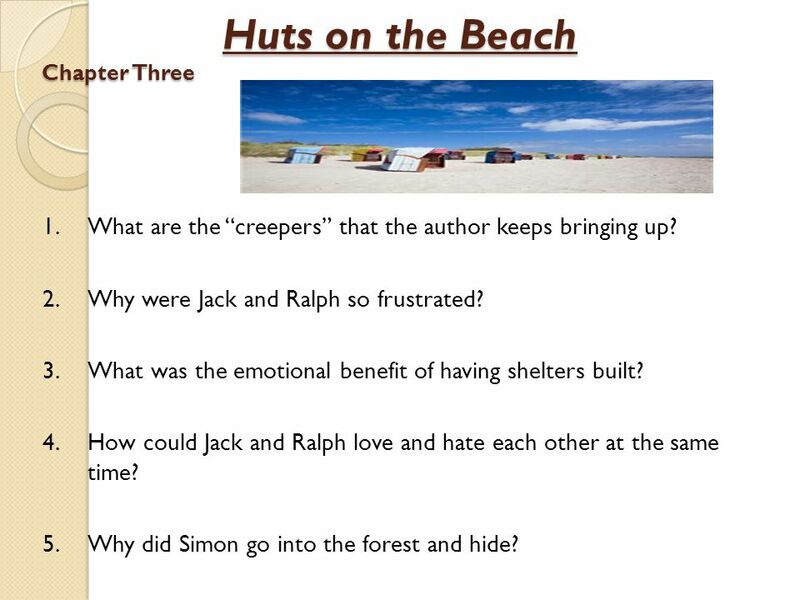 Published in  Lord of the flies is a scene of a deserted peaceful island until new comers come from a plane crash which they assign groups and. 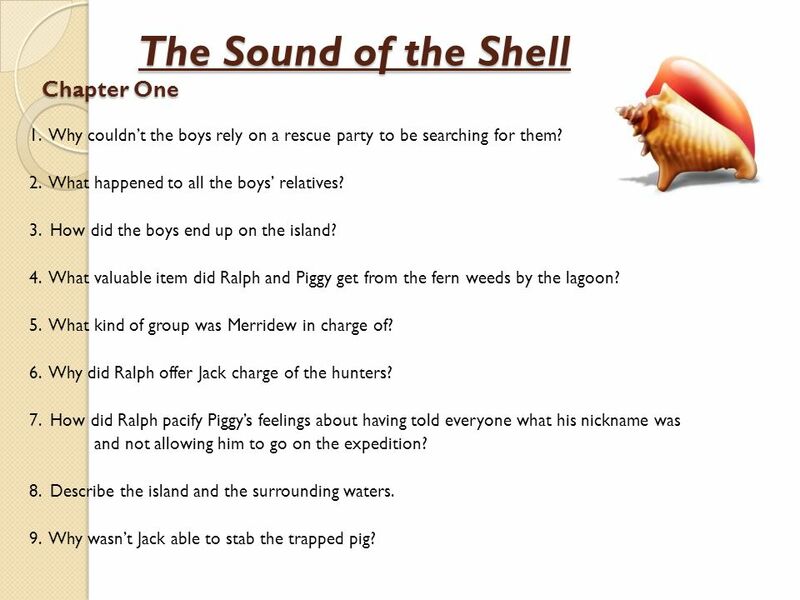 My presentation is talking about : Lord of the flies By By William Golding Or Or The sound of the shell. Quiz About Lord of the Flies by William Golding Mrs. Brandi Clay Shanklin November 29, 2010.